A degree of wisdom teeth removal swelling is quite normal. The big question is HOW MUCH IS NORMAL? There’s no one easy answer to this, as it depends on several factors. But there is ONE factor that is ALWAYS CRITICAL. You should ALWAYS be able to swallow quite normally, AND you should be able to breath normally. ALWAYS. If you are having trouble with either of these things, you should see a doctor or dentist as quickly as you can; you will probably need antibiotics. If the swelling is bad enough, you may even need to be admitted to hospital for treatment. So let’s get back to what is a NORMAL degree of swelling. As I said, there are several factors to take into account! Things that might cause wisdom teeth removal swelling BEFORE the wisdom tooth is removed, or during removal. Before wisdom teeth are removed, the dentist or oral surgeon will always make an assessment of the degree of difficulty. Quite simply, the more difficult the procedure, the higher the risk of wisdom teeth removal swelling. If there is infection around the wisdom tooth, there will be bacteria under the gum, and the gum will be swollen even before the tooth is removed. In this case, the dentist will normally give you some antibiotics BEFORE the removal, or even ON THE DAY. This should help to prevent infection and swelling after the tooth has been extracted. Next, if the wisdom tooth is tilted or jammed against the neighbouring tooth, the dentist will have to remove some of the bone around the wisdom tooth, to give it some room to move as he takes it out. Surgical bone removal is always traumatic for the tissues, and there will be INFLAMMATION around the tooth socket afterwards. This inflammation is NOT caused by bacteria, but by the trauma of the surgical bone removal. So antibiotics will not help. It may well cause swelling around the jawbone; this can be helped by using a cold pack on the OUTSIDE of your face, over the swelling, and by taking anti-inflammatory medication such as ibuprofen or diclofenac. Finally, you might get some additional problems if the tooth is difficult to get to, and you have to stretch your mouth open wide or the dentist has to do it for you, which can traumatise the gum, cheek and tongue in the area of the wisdom tooth socket. This will also cause inflammation of the tissues, leading to swelling. 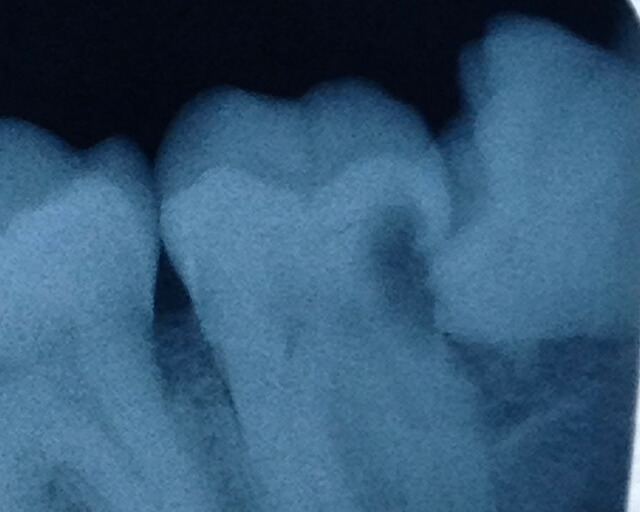 Image above - an impacted wisdom tooth on the right side of the image, tilted sideways into the next tooth, causing a cavity. But what about the factors AFTERWARDS that can lead to wisdom teeth removal swelling? The main one is INFECTION. This is more common for wisdom teeth in the LOWER jaw than for the upper jaw. Why is the lower jaw more commonly affected? There are 2 main reasons. First, and most importantly, the jaw bone in the lower jaw is MORE DENSE than the bone of the upper jaw. This means that it has fewer blood vessels, so the blood supply is more restricted. In turn, a poorer blood supply means that you have less “immune system” going through the area. And so bacteria have a better chance of getting a foothold and setting up an infection in the tissues. Your immune response in that little area is overwhelmed. The second reason why the lower jaw is more likely to get an infection after a tooth extraction is down to GRAVITY. It’s much easier for bits of food debris to fall into an extraction socket on the lower jaw. In the UPPER jaw, the bits tend (usually) to fall out. What can you do to help PREVENT wisdom teeth removal swelling? First, you can reduce the levels of bacteria in your mouth BEFORE the surgery, by spending TWICE AS LONG brushing your teeth, especially in the area around the wisdom tooth, for 7 days beforehand. A good-quality electric toothbrush is essential here. Check out my top recommendation - the Cybersonic3. On the day of your wisdom tooth surgery, you should rinse around your mouth with a good quality antibacterial mouthwash - for 60 seconds. Time yourself! Do this first thing in the morning, and then again JUST BEFORE going to the dentist’s office. I recommend the TheraBreath oral rinse. By doing these things you will REDUCE the levels of bacterial plaque in your mouth, and so reduce your chances of bacteria setting up and infection. Second, AFTER the surgery, there are 2 tricks. The most important thing is to NOT DISTURB the gum where the tooth was removed. Most of the time, after wisdom tooth surgery, you will have a couple of stitches (sutures) in the gum, to help close the socket. We want a blood clot to form inside the socket, and fill it up. If you disturb that blood clot, you run the risk of the clot coming out, leaving an empty socket behind. NOW the stage is set for food debris to get lodged in there, which becomes infected with bacteria, subsequently infecting the bone of the socket and the gum. OUCH! THEN you get a wisdom teeth removal swelling! SO DO NOT DISTURB THE CLOT! Simply, DO NOT go rinsing around the area with mouthwashes or water OR ANYTHING in the first 24 hours. If you want a drink, that’s fine - BUT just swallow it straight down; don’t swish it around your mouth before swallowing. Other things yo could do which would disturb that initial blood clot would be to poke your tongue or your finger around the gum where the tooth was. RESIST the temptation! JUST LEAVE THE AREA ALONE for 24 hours minimum. The other thing to avoid is smoking. To be honest, for this to help, you’d have to give up smoking for at least a month BEFORE your surgery. That’s because the problem with smoking is that it interferes with the blood supply within the gums. I have seen and heard of a few other recommendations, such as avoiding hot drinks, not drinking milk, and avoiding cold drinks. NONE of these makes much sense; if there IS any benefit from them, it would be TINY compared to the main things I have written about above. What if you ALREADY have a jaw swelling after getting a wisdom tooth removed? Here’s my short list of what to do! First, make sure that you can breath OK and that you can swallow OK. Those are the most important things. Next, apply a cold pack to the skin on the OUTSIDE of your face, directly over the swelling. You can use a dedicated cold pack like a “physiopak” from the pharmacy, or you can use a bag of frown vegetables (or similar) from your own freezer. IMPORTANT: put a thin cotton cloth over the skin, to separate it from the cold pack, to avoid skin damage. ALSO, only hold the ice pack in place for a maximum of 8 minutes. Remember - NO LONGER than 8 minutes, otherwise you risk frostbite! You can repeat this cold pack treatment every 2 hours. In addition, you can apply some heat to the gum INSIDE YOUR MOUTH. The easiest way to do this is in between the cold pack sessions, by using some HOT salt water. Just use a half teaspoon of normal table salt in a cup of HOT water - but be careful NOT to burn yourself! Just take a mouthful of the hot salty water, and GENTLY rinse it around the extraction site for 10 seconds or so, until you feel the water cooling down a little. Then SPIT IT OUT, and take ANOTHER mouthful, and do the same. You should get 4 to 5 mouthiness out of a cup. Repeat this treatment every 2 hours, in-between the cold packs on your face. REMEMBER - NEVER PUT ANYTHING HOT ON THE OUTSIDE OF YOUR FACE -it could draw infection (if present) into the tissues of your face. Finally, you should take some anti-inflammatory medications. The simplest over-the-counter drugs are ibuprofen and diclofenac. Ask your pharmacy for their recommended doses. 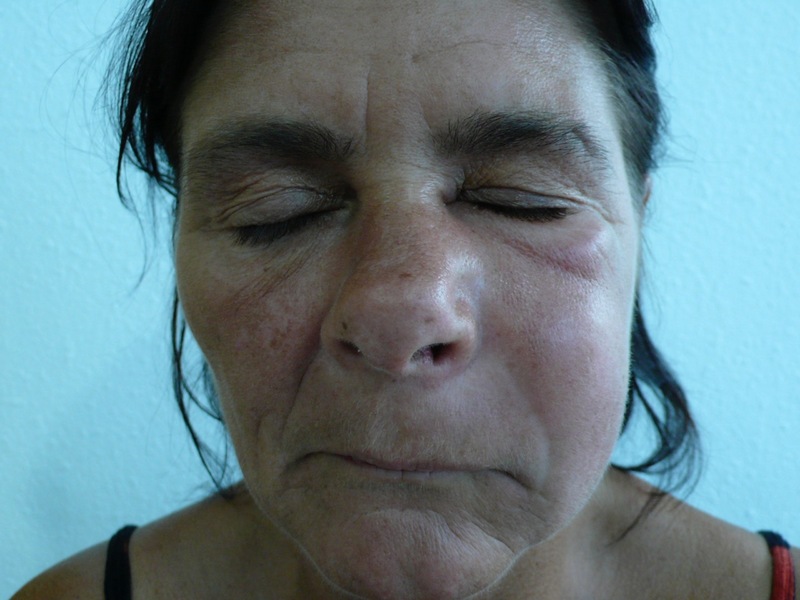 If you are having real problems with swelling, your doctor or dentist may prescribe steroids. If there is evidence of infection in the jaw, then you will need antibiotics. Exactly WHICH antibiotic will depend on the bacteria that are present. Frequently your dentist can take a swab and send it to the laboratory for sensitivity testing, which will show which antibiotic will work best. Unfortunately it can take 24 hours for the results to come back, so you might start out on Amoxicillin initially until the lab tests are returned. Wisdom teeth removal swelling may be a significant problem for you after getting one or more wisdom teeth removed. The risk is ALWAYS there. We can never cut the risk to zero, BUT if you follow your dentist’s advice carefully and follow my recommendations, you will minimize your risks.